I like fries and I love cheese but even more so, I love gravy so when I first saw poutine on a TV food show, I knew it would be right up my alley. I’ve never made it but while on our trip this past summer I had some at a restaurant in Michigan's UP and as expected, I really liked it. For those who may be unfamiliar with it, the dish consist of fries topped with cheese curds and then brown gravy – how could anyone not like that. 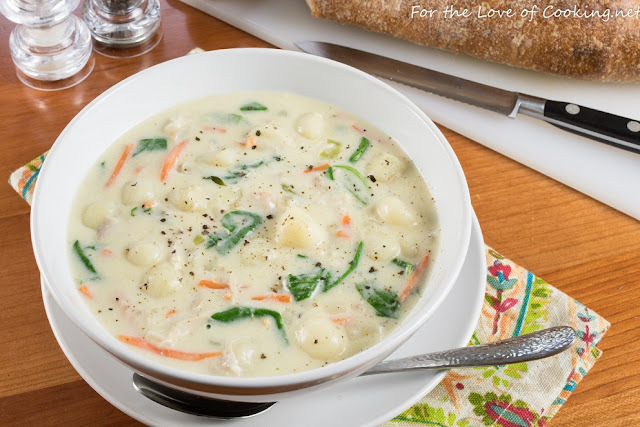 I had some leftovers from a couple of meals and while they will not make real poutine, I did have some rich beef broth from a recent batch of Italian beef, some cheese (not curds), and some potato gnocchi left from making Pam’s delicious Creamy Chicken Gnocchi Soup (For The Love Of Cooking blog). Since we just followed Pam's recipe except we used kale, I didn't post about it but our soup looked like this shot of hers and I highly recommend it. I first diced up a handful of Fiery Fiesta cheese, from Sweetwater Valley Farms into curd sized pieces. Then I made the gravy using a Tbsp each of butter and flour (for a roux) with the cup of meat chunk containing beef broth. Finally I sautéed the gnocchi in olive oil per the package directions to add a little crispness to the outside and then built my dish. I always forget to put some green on top for pretty. I had enough gnocchi for 2+ meals and Cindy opted to have hers tossed with pesto and after the soup, Bev decided she was not a fan of gnocchi and said she would eat something else. Then she taste both of our meals, changed her mind, and ate part of mine – forgot to take the photo of Cindy’s but she oohed and aahed over it. When I saw poutine being made on TV at a Canadian restaurant, the chef said that the key to great poutine is the gravy and he put a lot of effort into making his. Well my gravy was very good and I sure agree with this chef’s beliefs so I've put in my request for beef bones when the neighbors put up their beef this winter. I loved my meal and gnocchi will be a regular in our house in the future - sauteed, they reminded me of small potato pancakes which is a favorite of mine. In addition to fries and gnocchi, I believe this dish would be very good with Tater Tots or Tater Crowns. I’m pretty sure that sautéed gnocchi and onions topped with cheese and a fried egg would also work well – stay tuned. Poutine is a very tasty indulgence the we get in Canada available in mort restaurants and fairs. Would be interesting with Gnocchi . We watched Anthony Bourdain feature poutine in one of his "Parts Unknown" episodes. I had never heard of it until then. I used to buy cheese curds all the time when I lived in Kansas, and now can only find them one place here in Colorado. LuLu's clear out in Brighton. I always pick up a package. Love them. Thanks to you, I feel inspired to cook with them instead of just snacking. And I love your gnocchi, onion and egg idea. I love gnocchi, and have even made it homemade - so easy. I have a recipe similar to this one and love it. I use spinach :) Bravo! I had never heard of poutine either until a good friend's son moved to British Columbia for a teaching position and they had poutine when they visited him. Clever interpretation and Pam's soup looks wonderful! The one dish we didn't try (but wanted to) while road tripping through Canada was poutine. We were so bummed that we didn't get a chance to order it. I love your version with gnocchi and the gravy looks rich and delicious. Gnocchi seems like a weird thing, yet it's surprisingly delicious. I'm not a gravy person, but I'm betting my sons would love this. Gnoochi sounds GREAT ----and using it to make your Poutine sounds amazing..... I'm a potatoes/dumplings/cheese person ---so that meal would be delicious --including that delicious soup of course. wow I love everything now I just ate and hungry again! I made Pam's soup, too, but I used tortellini since that's what I had. IT was not as pretty as hers, but it was all gone at the end of dinner, so that says something. I'm glad you tried it, too.